1 A long time ago, dragonflies were called "devil's darning needles." At night when children were sleeping, dragonflies would sneak into homes and sew together the lips of bad little boys and girls. But that is only a story! Dragonflies really aren't harmful to people. Dragonflies don't bite or sting. They eat pests such as mosquitoes, gnats, and termites. 2 Dragonflies have very large eyes. Each eye has up to 30,000 lenses. 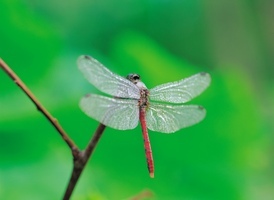 A dragonfly can turn its head almost completely around, so it has a field of vision of almost 360 degrees. A dragonfly can easily spot its prey.